On day one’s sprint race, it was all Mo Freitas, however on day two’s distance race, Mo had to settle for runner-up behind a very impressive Paul Jackson from Australia. Jacko mastered the tricky upwind/downwind conditions, finding bumps and a couple of well-timed waves to win comfortably and leap-frog into second overall. Quite fitting that Jacko took the win seeing his wave, Angie, was so dominant on the women’s side of the draw. From all reports the Japanese hosts went above and beyond to make the handful of international stars feel welcome. Angie even had a personal repair team after her board was mangled by United Airlines. 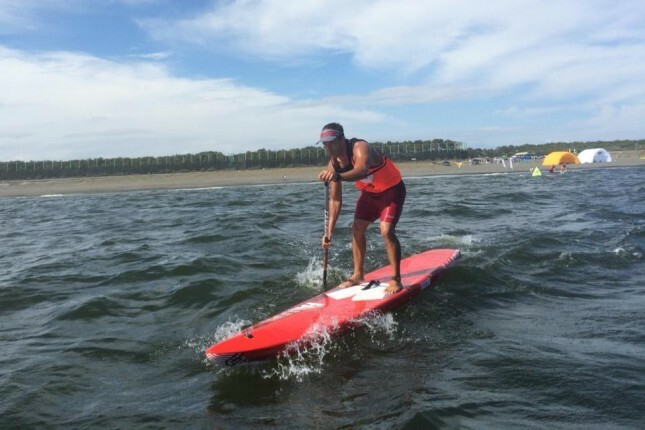 However it must be said that it was rather unfortunate timing for this event: Japan has a fast growing SUP scene full of stoked paddlers but they didn’t get their chance race alongside the world’s best: The Stand Up World Series-based Shonan Chigasaki Pro was scheduled on the same weekend as the Ultimate SUP Showdown over in Hawaii. Not the best idea if you want to attract a stellar lineup. This was a $20,000 race in a part of the world that almost any paddler would love to visit, yet it didn’t get the attention or attendance that it deserved. However I’m hopeful this event is the first of many big international races in the Land of the Rising Sun. Every Japanese paddler I’ve met has been one of the most genuinely kind and super stoked people I’ve come across in this sport. Hope to be there next year in person.